If you didn’t get to Seriously Bewitched, the ASSAP conference on witchcraft in London last Saturday, you missed a treat. All the talks were brilliant. They were on a range of subjects from witch trials to how spells work. My personal favourite talk of the day was Dr Helen Cornish speaking on Bewitching Bones: Stories of the Fighting Fairy Woman of Bodmin. She started by saying that storytelling is one of the key ways we make history. 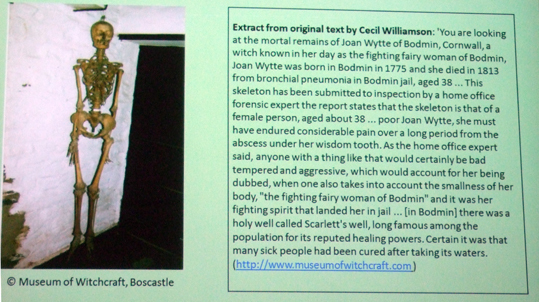 The stories about Joan Wytte, the so-called Fighting Fairy Woman of Bodmin, are connected to the Museum of Witchcraft and Magic in Boscastle. 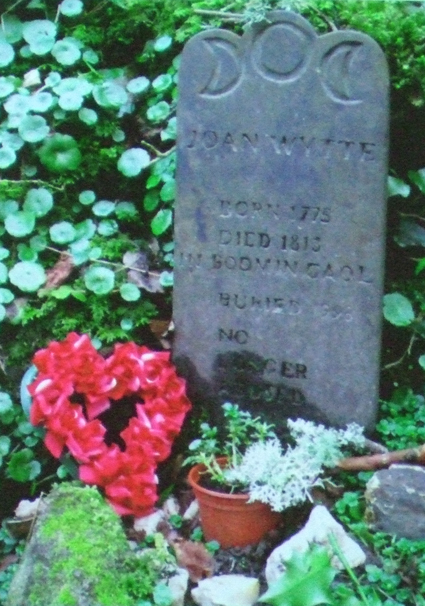 The picture to the right shows a grave with the headstone to Joan Wytte in woods near the museum. There is now an annual pilgrimage to the grave. Helen Cornish said that when she visited the museum in 1998 the skeleton that is now buried in the grave lay in a velvet-lined coffin in museum. By her next visit, in 1999, the director had put her to rest. There were stories that Joan’s ghost had said she wanted to be buried, that her coffin lid would be found shut in the morning when it had been left open the night before. People would say they had been dreaming of her. These swirling conversations were happening at a time when museum practice regarding the ethics of displaying human remains was also being discussed. In October 1998, on a dark and stormy night, she was buried. The event was recorded by national and local media and on internet sites about Cornish folklore and witchcraft. Yet there is actually no evidence that Joan existed as a real woman. However, Helen said she wasn’t trying to say we should forget all about Joan, rather she wanted to make us question the idea that there is hard truth. Joan is part of the history of witchcraft whether she existed or not. How the story has been construed by witches and historians is not a stable form of knowledge. The skeleton got to the museum in the 1960s under its founder Cecil Williamson. He liked telling stories and his explanation was that the skeleton was the mortal remains of Joan Wytte of Bodmin, but that her fighting spirit landed her in jail, not witchcraft, and she died there of pneumonia. He got evidence from a forensic expert that it is the skeleton of a woman, who probably lived in Bodmin and the fluoride in her bones showed she probably drew water from Scarlett’s Well. The examination also showed she had had an abscess on jaw. The bones are said to have come from Bodmin Jail, from where there is another story. It was said that a séance around the skeleton was so terrifying the bones were locked away. After many years they went to a doctor’s surgery, then were bought by Cecil for the museum where the skeleton was hung from a wall on display. In 1996 the new owner of museum took her down and put her in a wooden coffin. She was later put in a soft coffin and buried in the woods. Now there is a small exhibit about her on wall of the museum with a picture and descriptions of local historic folk magic practices. The story is still changing after her burial and a new director of the museum is intending to rewrite the display. Other strands of Joan’s story are independent of the museum; Kelvin Jones wrote a rich and elaborate story of her as a witch in two books: Witchcraft In Cornwall and An Joan the Crone: The History And Craft of the Cornish Witch One Cornish storyteller tells an emotional account of her life as an idealised cunning woman betrayed by her community and sentenced to hard labour until death at age of 38, followed by her abuse by an anatomist and by the museum until her burial. It might not be accurate history, but it resonates with listeners on an emotional level. Joan Wytte’s story also used to be told as part of a tour of Bodmin Jail given to tourists, but no longer. Another of story is in archives and there are historical documents that verify some aspects. Scarlett’s Well does have unusual properties. The skeleton and records of its study do exist. But there probably was no Joan Wytte, Fighting Fairy Woman of Bodmin – there are absolutely no records of a Joan Wytte ever existing as a person. She does not appear in census returns or Bodmin Jail’s records – although they are incomplete. There are no newspaper reports of her. But the search itself has become part of the archives and she is now part of the history of Cornish witches whether she really existed or not. If we want to take a rationalist approach we could say that the timings don’t fit with the history of witchcraft or the history of the jail, which wasn’t as bad as the stories say anyway. The skeleton might have been a teaching model made up of composite bones – these were common. But the stories themselves are relevant for today’s practitioners and she has literally become part of the Cornish landscape, in the form of her grave. Having memorials are an important part of history in the modern world. Tracing the changing ways the story was portrayed charts the changing ways of describing witchcraft history and displaying bones in museums. The story now has global resonance – the pilgrimage and folk performance reflect 20th century hopes and fears about witchcraft. This was so interesting, thank you. Found Joan’s memorial plaque when I visited Minster church today. Various trinkets have been left there indicating that others give credence to Joan’s existence and abilities. No one was at the church or it’s grounds so I was alone at the spot on the edge of the woods but as I lingered there in contemplation it didn’t seem so. RIP Joan.